The basic idea for this is instructable is to make a lamp out of simple hardware and recycled materials that can be controlled by touching the metal base. I've been sitting on this idea for a while now, but seeing the Lamps and Lighting contest gave me the final push to actually make this idea a reality. Another great feature was that the entire lamp, minus the microprocessor, was made from items at Home Depot. Lucky for me, I recently joined the Alamance Makers Guild. There, I met Danny, a computer whiz with a knack for Arduino. With his programming and circuitry skills and my ability to operate power tools, we were able to finish this project and hopefully get our Makers group known. We're also hoping to win some tools for the Maker Space we plan to build. We used the Arduino code from the trays as the start for our own code. The simplest way I could think to do this instructable was by segments of the lamp. Each segment is unique and independent. You can use an entirely different light enclosure, lamp base, or micro-controller, but the concept stays the same. This is a touch lamp made from simple hardware and micro-controllers. Each section lists the materials and hardware used to make the part and the detailed instructions are put as notes in the accompanying pictures. The code for the board is provided as a .txt. I would post it in this section, but I had trouble with the formatting. (3x) 10-32 set screw 3/8"
(3x) 10-32 set screw 3/4"
The top assembly is focused on the pine bun foot. By modifying this part, we can mount the bulb and glass globe to the fence post. To see a step-by-step breakdown for making the adapter, click through the above images. (4x) 10-32 BHCS (button head cap screw) 2"
To see a step-by-step breakdown for making the base, click through the above images. A special thanks to Mr. Gene who either machined or instructed me to machine almost the entirety of this base. Navigate the bulb wires down the pole and connect to the breadboard. Then, connect the alligator clip to the base of the pole. Finally, slide the electronics board into the base and close your secret door. You can have your power cord stick out the secret door or through the hole in the base. 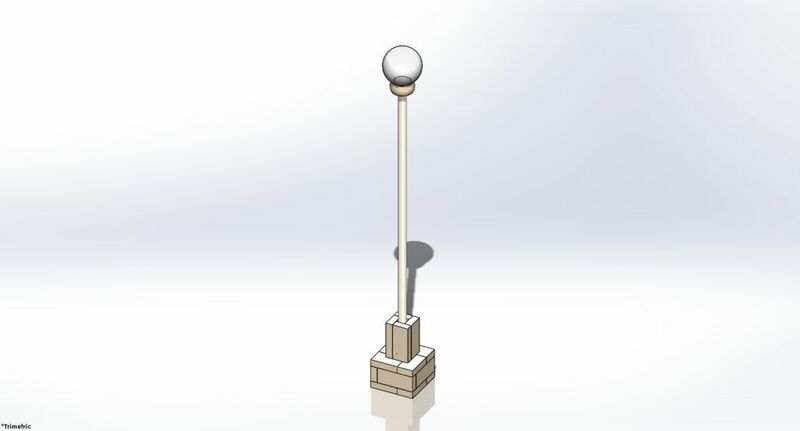 For those who are interested, I created a 3D model of the lamp in Solidworks to make modifying the design easier. Let me know if you need the file saved in a format other than .SLDASM or .STL. One improvement that eventually became a necessity was a 12V LED light bulb. Surprisingly, we couldn't find one to buy, so Danny came up with a new light bulb, a "sensible light bulb". We also started the project with the hope of controlling the dimming effect with sliding hand motions. Unfortunately, we were not able to make a circuit which allowed us to watch small changes in capacitance between sensors on each end of the pole. If anyone knows a good way to do this, we'd love to hear from you. Because circuit is not clearly shown the power component could be voltage regulator and not power transistor. Still, might need a heat sink. The power transistor might need a heat sink, especially if the lamp resistance is low and the transistor is not saturated. Circuit is not clearly shown in this instructable. Really nice project and ideia! I definitely do It! But can you say what components you used in the Arduino to make the capacitive sensor? Unfortunately I don't know what components were used on the board aside from what can be deduced from the picture. We were in a hurry to finish this project for the Lamps and Lighting contest so my partner did the whole circuit and we forgot to make a circuit diagram. Sorry about that. Sorry, your program is not working ! Please look at the attach..
niceee! ill try using this for my lamp project! Great work! For variable capacitance sensing, have you tried looking into working with e-textiles? Thank you. I haven't dabbled in e-textiles yet, but that is a great idea. I'll see if I can find a solution from an e-textiles project.